With temperatures dropping and snow beginning to fall in many cities, it’s time to make sure your home is warm for winter. More than 70% of our household’s energy consumption is spent on heating, so how can we heat our homes more efficiently? The most important thing you can do to help keep as much heat as possible inside your home, is to insulate. Foam insulation for your loft is usually quite cheap, but you may even qualify for free home insulation with your energy provider. 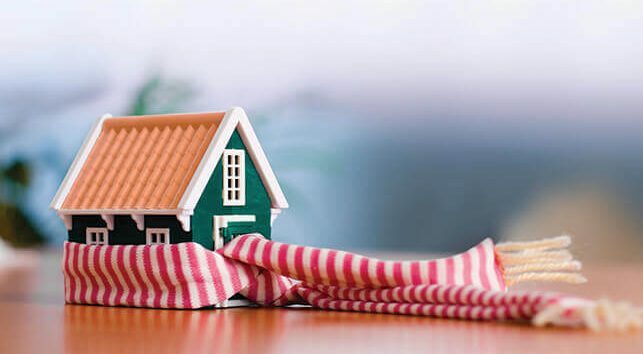 If your home is left without cavity wall and loft insulation, 25% of the heat generated will be lost through the roof and 35% lost through the walls. Loft insulation can also help reduce your energy bills by up to £140 every year and is completely maintenance free. If you know you have electrical cables in your loft, seek electrical advice to prevent from overheating of cables. If your windows aren’t double glazed you could lose up to 25% of the heat in your home. Despite the cost of double glazing, they are heat efficient and will help block help block any risk of draughts. Cold draughts can quickly affect the heat of your home and with effective draught sealing, you could save up to £55 every year. However, you should also remember to seal letterboxes, cat flaps and even keyholes to prevent letting cold air in. Thick curtains can also act as draught excluders during colder nights, preventing any heat from being lost to the windows. During the day, keep your curtains open to let the sunshine in – sunlight is free and efficiently warms your home! Once the sun sets, close your curtains to help insulate. Heat can commonly be lost through chimneys which are not in use. With fireplaces becoming features in many homes these days, homeowners forget that it is effectively a cold air tunnel for heat to escape through. A chimney balloon is cheap and effective and it can be inflated inside the chimney to close it off and keep inside. Make sure your radiators are not blocked by any large pieces of furniture, like sofas, as you will end up heating the item instead of the room itself. Wood flooring accounts for 15% of heat loss as it doesn’t store heat like carpets do. Rugs on floorboards can help retain some heat, while warming up your feet too! It’s a myth that keeping your heating on a constant lower temperature is better. If your heating is constantly at a set temperature all day long, it will require a certain amount of energy to keep it going. Similarly, it will also use a lot of energy to boost it from cold to warm. However, if you leave your heating on constant, you will no doubt be losing heat through draughts, despite any insulation you have installed. Ovo Energy explain that the most effective and energy efficient way to heat your home is to set times for central heating and only heat your home when it needs it. If you interested in finding out more about energy efficiency, read on to find out how smart meters could save you money on your energy bills!